Police arrested two men after an alleged machete incident outside of the venue where Justin Bieber's concert will be held tonight in Cardiff, Wales. 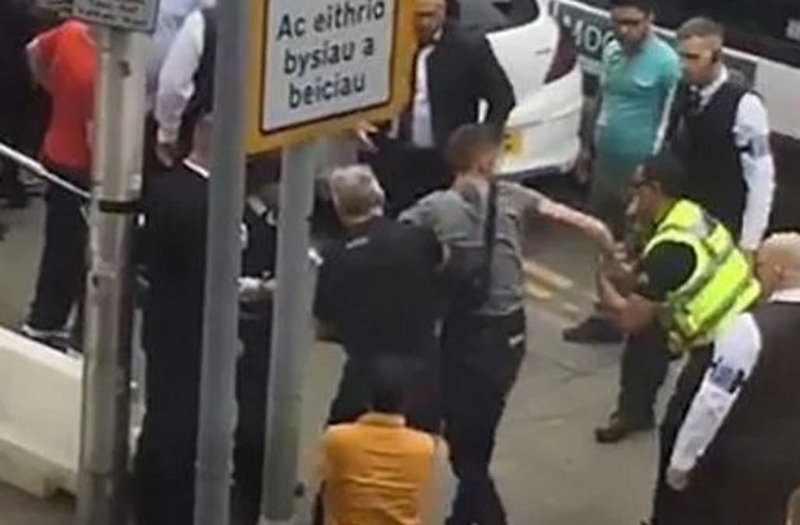 Footage of the incident emerged showing Wales police wrestling a "machete-wielding" man within yards of the Principality Stadium, where thousands of fans had already begun gathering for Bieber's performance. According to local outlets, officers recovered a foot-long blade from the man after tackling him to the ground on Friday afternoon. One witness told the Daily Mail: "I saw some guy with a machete that was around two feet. All I saw was some guy by a car with a machete that was around two foot. "He was being forcefully dragged to the floor. Then he was rushed away. It all happened in seconds. Security guard jumped into a car." As of now, the incident has not been confirmed as an act of terror, nor have police been able to link the encounter to Bieber's concert. A spokeswoman for South Wales Police told Wales Online the two men were arrested following a call of a "motoring dispute." "South Wales Police were called to a dispute involving motorists on Saunders Road, Cardiff, at approximately 3:05 p.m.," the spokeswoman said. "Two men, aged 19 and 27, were arrested nearby on Penarth Road. The 27-year-old has been arrested on suspicion of affray and the 19-year-old has been arrested on suspicion of using threatening behavior. Both are currently in custody at Cardiff Bay Police Station."